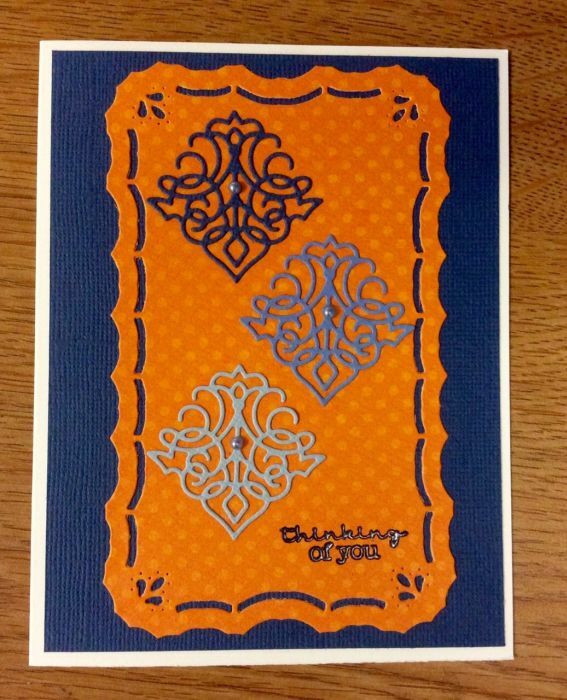 I created this card as part of My Favorite Things Summer School Lesson 11: Repetition. I used dies for the motif I repeated and heat embossed the sentiment with a pearly blue to pick up on the colors used for the dies and background. The dies create a nice rhythm down the card, drawing your eye to the sentiment. I decided to use complementary colors to make the elements pop. Thanks for stopping by. This entry was posted on Friday, August 14th, 2015 at 5:01 pm	and tagged with cardmaking, die cuts, embossing, my favorite things, spellbinders and posted in Challenges, General Cards. You can follow any responses to this entry through the RSS 2.0 feed.